We had a great Saturday last weekend. 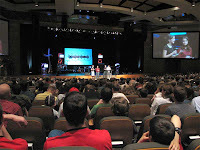 Several New Life Church students and parents attended a conference for teens called "Do Hard Things." It was sponsored by the Rebelution. As you may or may not know, our H2O ministry is featured in the book by Alex & Brett Harris called Do Hard Things. 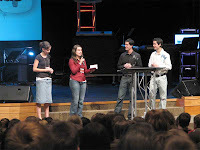 So, when they put on the conference with the same title last weekend, they asked Leslie and Lauren to tell about H2O. They got up in front of over 2200 students and parents and told their story and encouraged other young people to do hard things. In addition they gave out almost 600 H2O bags and near 500 starter kits. We are excited about the multiplication opportunity this presents. Our prayer is the other young people will pick up this ministry in their churches and together we can eliminate panhandling in the Portland area!